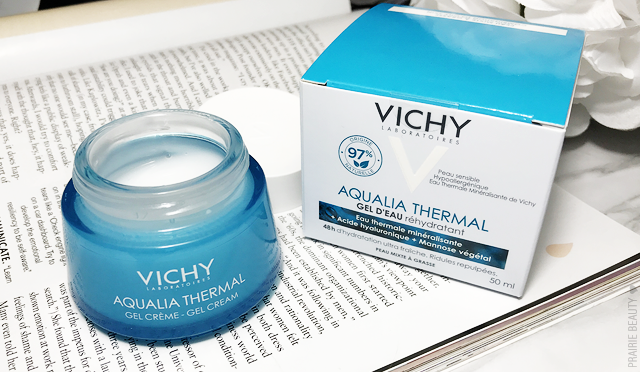 I have to say, I was SUPER excited when I found out that VICHY had reformulated their Aqualia Thermal line and were coming out with four new, exciting products. This line has long been a favorite of mine, particularly for my winter skin, so I was excited to see products that I suspected would work for my normal leaning combination skin type all year around. 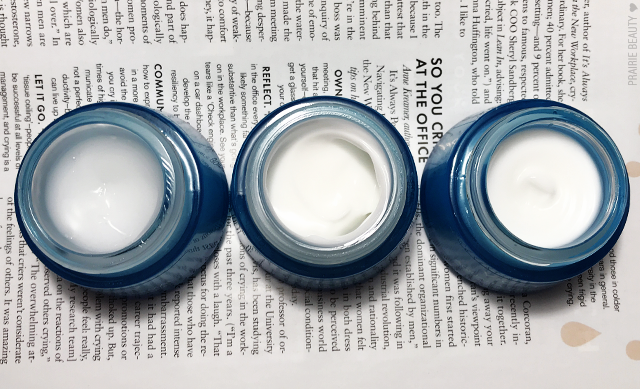 With a new serum and three different moisturizers, I felt like there would not only be something for everyone, but something for the environmental changes that can influence what types of products we need to use on our skin. 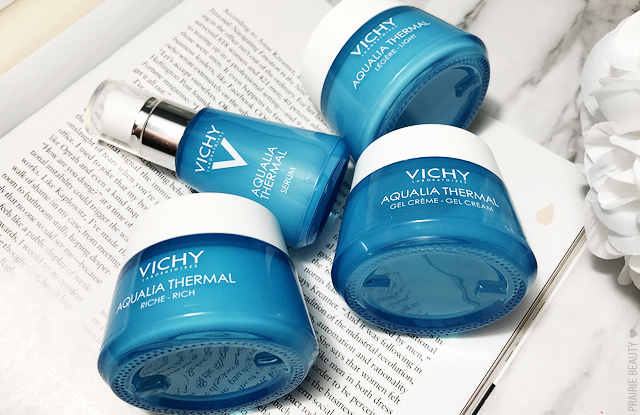 As you can guess from the name, the VICHY Aqualia Thermal range is all about hydration. Backed by dermatologists and tested in extreme conditions, these products promise 48 hour hydration and promise to be gentle on sensitive skin without any controversial ingredients like silicones or mineral oil. 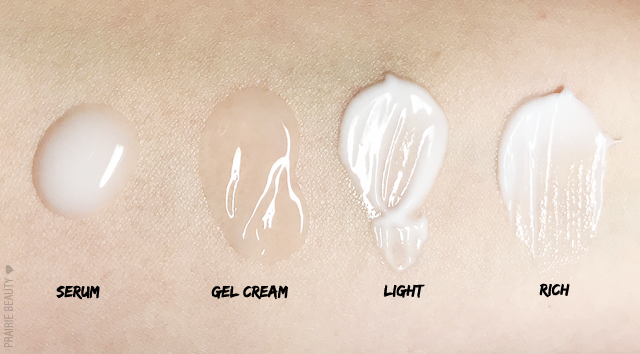 One of my absolute favorite things about this rebrand is definitely that they have the three moisturizers that have very different textures for very different needs. All skin needs hydration to look its best, but I know a lot of people who tend to skip out on the moisturizer because it feels too heavy for their skin or who use something lighter when their skin needs something a little bit more intense. This line definitely has you covered in that respect. As you can see in the above view, the textures of all three of these products are very different. 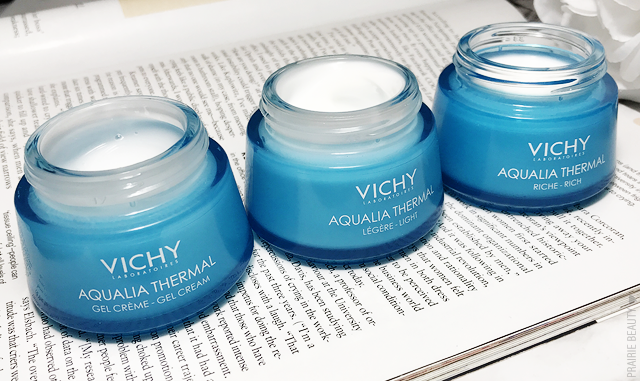 The Rehydrating Gel Cream* is, obviously, a water gel type formula that's really lightweight and fluid. The Light Rehydrating Cream* has a more lotion type texture, still fairly light but definitely more emollient than the Gel Cream. And, finally, the Rich Rehydrating Cream* has a very dense, emollient cream texture that packs some serious punch. For my summer skin, this is definitely my ultimate favorite of all of these products. The texture feels really light and smoothing and it sinks quickly into the skin, but as soon as I put it on there's a hit of hydration that really makes my skin look and feel healthier instantly. 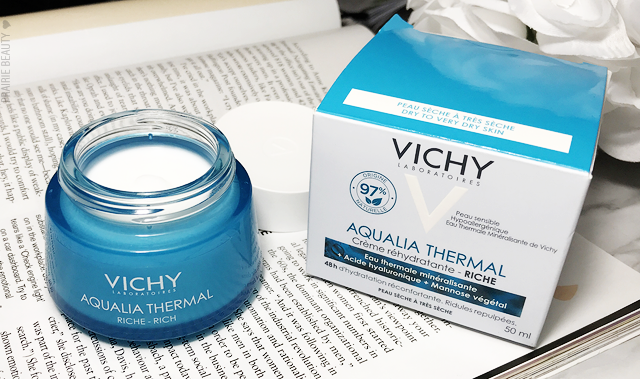 Because the warmer weather leads my skin to being more oily, I don't need as intense a moisturizer as I do in the colder months, so this is just right for what I personally need. I would recommend this for oily to combination skin types. For me, I think this is going to be a great winter texture for my skin. It's not as featherlight as the gel cream, so it's a little bit more than my summer skin needs, but it's not heavy either. Like the Gel Cream, this sinks quickly into the skin and brings a lot of moisture immediately without any greasiness left behind on the skin. 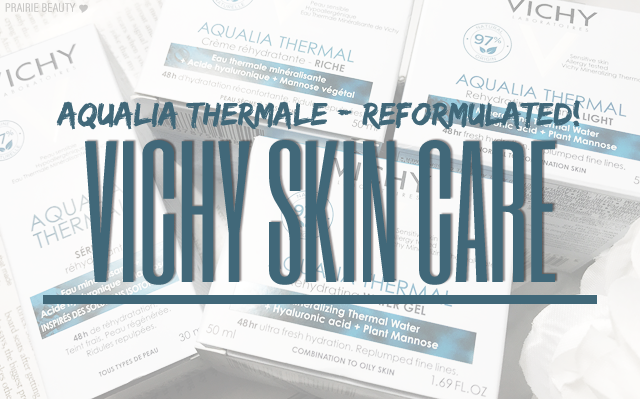 I think this is a great choice for normal skin types, or people with dry skin who struggle less during the warmer months since humidity is a good friend to dry skin. Finally, I am actually going to gift this to a friend of mine who struggles consistently with her dry skin because I suspect this will be a game changer for her. Rich and creamy, this moisturizer packs that heavy hit of hydration that I used to crave when my skin was really dehydrated and sensitive. It's rich, but I actually don't find the texture to be overwhelming on my skin. It's a little bit more than I personally need, but like I said, I think this could be a real game changer for people with dry to very dry skin. 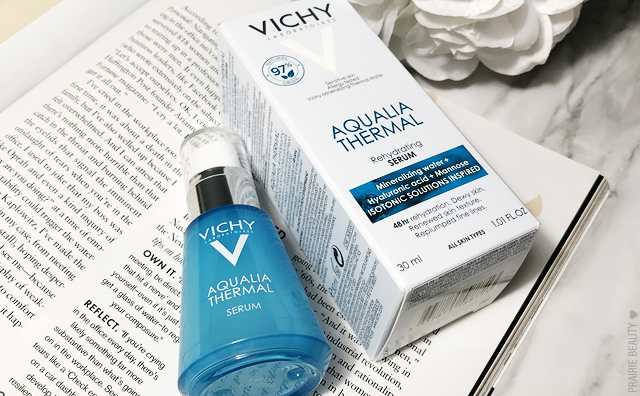 I actually discovered the original Aqualia Thermal serum because Sali Hughes - GODDESS! - recommended it really, really strongly and I think I loved it as much as she did, so I was hoping to really love the reformulation and I have to say, I do! This is a really liquidy, water based formula that smooths over and sinks into the skin effortlessly and gives an instant look and feel of hydration. This is actually an absolute must have for me when my skin is feeling dehydrated, which tends to happen in times of stress, PMS, and just general life being too much for it. With consistent use, I've seen really apparent results within a few days in the overall hydration of my skin, but it also gives an instantly plumped and brightened effect to the skin as well. I'm really, really glad that the reformulation didn't effect my love for this product. I feel like this photo really highlights the differences in these formulas. The serum and the gel cream are very lightweight and fluid, while the light and rich hydrating creams have a little bit more meat to them. I feel like anyone could find what they need in this collection as long as they listen to their skin type and try these out accordingly. Really, though, if you're not sure what your skin needs, I would test out the serum and the gel cream because I feel like they're both beneficial to absolutely any skin type. 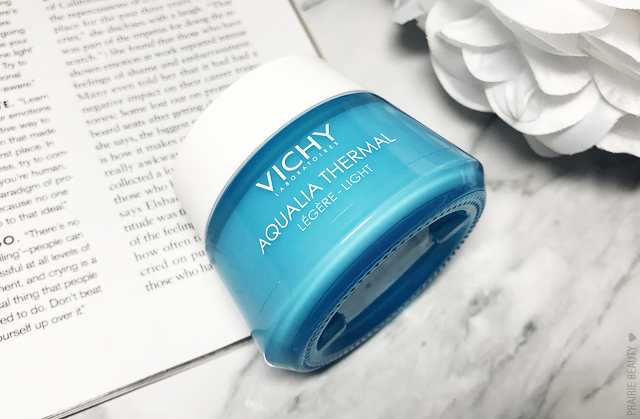 My love affair with VICHY Aqualia Thermal definitely continues. I've been consistently using the Serum and the Gel Cream over the past couple of months and my skin is absolutely loving it. Not too heavy, but absolutely getting the job done in these warmer months. Without question, this entire range gets a thumbs up for me and a huge recommendation. 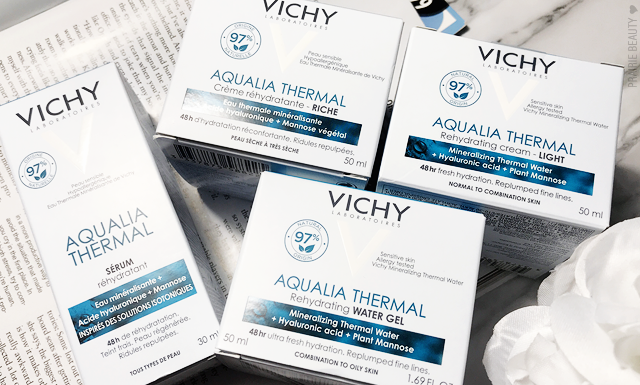 These products are widely available now wherever VICHY products are sold - I always pick up mine at Shoppers Drug Mart!